Learning about particular places is an essential part of Environmental Studies. By the time each student graduates, she or he should have developed intellectual insight into and personal experience of four places: “Home,” “Here,” “There,” and “The World.” For practical purposes, “Here” is the Berkshires and “There” is a place where the geography and socioeconomic circumstances are outside the student’s previous experience. Although this goal is not a requirement of the majors or the concentration, it is a significant aspect of the program, and CES resources are aimed in part at enabling all students to meet it. For example, students are encouraged to pursue summer internships in their “Home” communities, and field courses in natural science, environmental planning, and other areas can deepen familiarity with “Here.” Summer recess and Winter Study provide many excellent opportunities for research and other learning outside the New England region. Study Away: Many study away options are available to students in Environmental Studies, including the Williams-Mystic Maritime Studies Program. Furthermore, the Williams-Mystic Program is the foundation of the Maritime Studies concentration. Students considering either a semester or year away who intend to major or concentrate in Environmental Studies should consult the Chair or Associate Director of Environmental Studies and the Dean in charge of study abroad as early as possible to discuss their options. 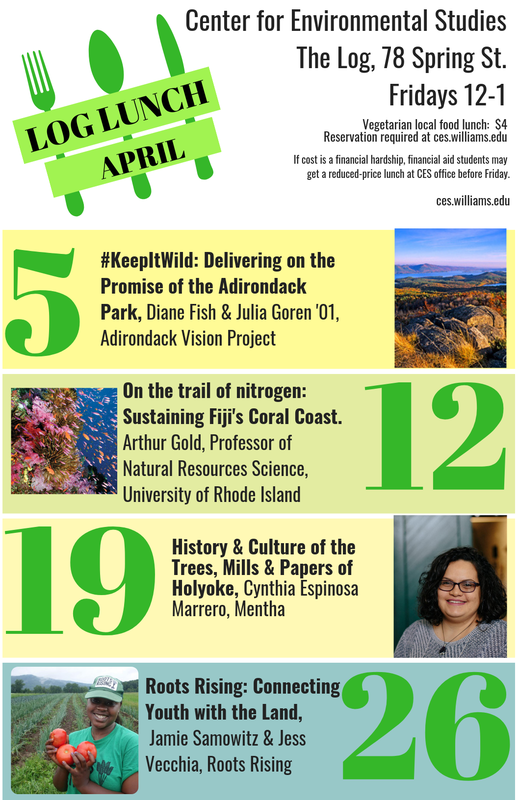 Students may take up to two courses outside of Williams toward their major or concentration, but must have advance approval in writing from the Chair of Environmental Studies. Many students take advantage of a wide array of off-campus opportunities. Williams College administers a semester long interdisciplinary program in maritime studies based at the Mystic Seaport Museum in Mystic, CT. Commonly known as “Williams-Mystic”, the program incorporates the study of marine policy, maritime history, literature of the sea, oceanography, and marine ecology. Environmental studies students also participate in programs run by The School for Field Studies”, The School for International Training, and The International Honors Program, as well as those organized by other universities and organizations. Some programs allow students to enroll directly in a university in another country, while others are designed specifically for groups of students from US colleges. Students have the opportunity to choose from programs in North America, South America, Europe, Asia, Africa, and Australia. ENVI students are encouraged to take advantage of the opportunities provided by such programs to experience other cultures, to gain proficiency in another language, to take courses not available at Williams, and to become familiar with and conduct research in an environment different from the one they are accustomed to.